Are you looking for reputed Glendale process servers for any of your personal or business requirements? There are plenty of experienced and highly qualified process servers throughout the state. However, it is always handy to have some basic information before you start your search. Let us first find out what service of process is all about. As per the legal procedure in America, all parties are required to be notified when they face any type of legal action in an administrative court or court of law. This notification is known as the service of process, and the process is accomplished by the delivery of different documents that describe the legal action. The job of a process server is to deliver these legal documents to the defendant or any other individual who is involved in the legal procedure. An efficient process server serves all documents according to the legislation in the state. This includes personally handing over the documents either to the defendant or to someone else in the business or family. After delivering the documents, the process servers must also furnish evidences to establish the fact that the documents were served. This document of evidence must be notarized, and is called proof or service, or affidavit of service. Your appointed AZ process servers must also provide you document retrieval service for all your relevant documents in the courts. Some process servers also offer different types of investigative services like surveillance, people locates and skip trace. Throughout the state of Arizona, the process servers are required to be licensed. 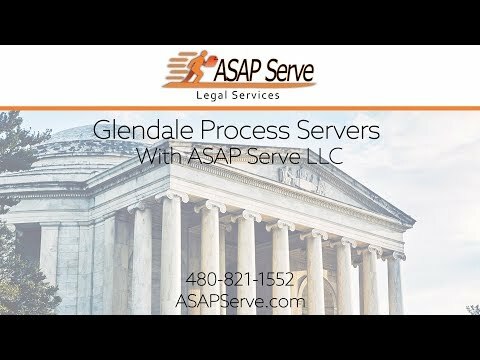 All Process Servers are required to be certified by the Arizona supreme Court, and while a security bond is not required, it can be to your advantage to hire a process server that is fully bonded. All applicants have to pass a written test before becoming process servers. While choosing your process server in Glendale, make sure you opt for someone knowledgeable about the legal process in the state. Finally, you must also have a fair idea about the cost involved in appointing a process server. These rates can vary a great deal depending on the nature of the case. Be prepared to pay an elevated charge in case you need rush serves or same day serves. The rate for a routine serve can also vary between $20 & $100. A routine serve is one that is attempted within 5-7 days from receiving all the documents. The best way to appoint your process server is to contact several AZ process servers, and finding out their number of attempts, turn around time, and cost.